India is one of the fastest growing economies in the world and construction sector contributes significantly to this growth. Government of India together with public and private sectors has charted ambitious growth plan including Residential, Commercial and infrastructure segments. This formidable task is possible only with innovative design and construction technologies. The Concrete-Steel composite structure may include the Composite Floors, Composite Beams and Composite Columns used individually or in varying combinations to make the design cost-effective and efficient to the desired performance and service requirements. Steel and concrete are optimally used to act together and thereby reducing the Life-Cycle costs and save valuable construction time. It is to ensure that the Structural system performs the required design parameters by optimizing the material usage as well as geometric properties of the elements of all the subsystems. Apart from the technical aspects of efficiency, economy and elegance, sustainability and holistic developments also need to be duly considered in design and construction. Concrete-Steel composite structures have now become a global trend, especially in urban scenario. The seminar deliberates on design and constructability aspects. 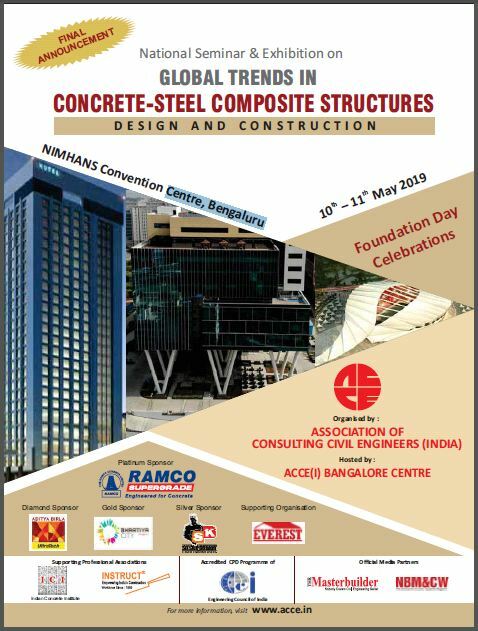 The Seminar is intended to bring together Architects, Structural Engineers, Builders, developers, Practicing Engineers, Researchers, Manufacturers and other construction industry related professionals including students to share relevant knowledge required to achieve optimum results and constructability solutions that ultimately give rise to more sustainable projects addressing Global Warming and Carbon footprint issues.